Lazy Sunday. Did not have much to do so I was just checking incoming SMSes and deleting some old useless texts from my cellphone's inbox. I like to keep some memorable texts I receive from people. Then, I came across the SMSes that my little brother, Juan, sent to me on 7th of October 2008. His 19th Birthday. In the past few years, especially since I have been living abroad, I am hardly able to celebrate my family's birthdays or mine with them. Can't have birthday dinner with them or whatever as their Birthdays don't fall on or near the times where there is any Public Holiday where I can take leave and go home. Juan and Christine. Malang, 3 January 2009. 7th October 2008 morning, I told my Mom to prepare some fried noodles that noon as it was my brother's birthday. A small reminder of his birthday would be good, I uttered. I sent a Happy Birthday SMS to my brother. He was at school that morning so the least I could do was sending my birthday wishes via text message. I meant to ring him later on when he has reached home. In the late afternoon, I was busy working in the office and got his SMS reply. He said thanks and mentioned that the Ice Cream Cake that his then girlfriend delivered to our house was already melted by the time he came back to school as my parents were not aware that the cake was from Ice Cream and thus, did not put it in the freezer. He was very upset, especially since he said no one gave him Birthday present other than his then girlfriend. I immediately called and comforted him as I believed there was no one to blame in this situation. My parents did not know that it was an Ice Cream Cake and the delivery guy did not inform them. It was just a pure sad regretted occasion I explained. Then, he understood and sounded okay. But I pitied him. After he called, I felt so uneasy. I kept thinking: This is so sad. What should I do? How to make him happy on his Birthday? How to send a birthday cake from Singapore in last minute? I didn't think any Cake House in my hometown has any credit card facility or online services. Duh! Then, I remembered Astrid. I rang this good friend in Malang whose aunt has a renowned Cake House in Malang. It was almost 3.30 in the afternoon. Usually, she is pretty hard to reach, but that day, she picked up my call. I immediately told her that I needed her help. She asked back, 'What is it?' I told her what happened. "Could you help me order me a cake and deliver it to my house, like now? I'll pay you back when you come to Singapore next month". She said, "Cool, OK. I'd make a phone call and order one. What cake do you want? What message will you write for him?". I thought hard. I didn't know what cake my brother likes. Amongst all of his favorite food that I know he likes, I just never paid attention of what cake he likes. Then I jokingly answered, "Whatever available. Black Forest is good too. I don't know about the message. Just write anything you like. Happy Birthday. Whatever". Astrid said,"Sure. I'll get the price quotation and inform you again via SMS soon". Minutes later, I got her text message, asking me how big the cake I wanted to send. What my address was and how old my brother was. I told her my address, asked her to get "19" candles and informed her to get the biggest cake available and not to care about the price. She said "OK" and teased "How nice this big sister is, buy me a cake too when my birthday comes, OK?" I said "Yes, I'd get you a chocolate tart on your birthday in Singapore". I thanked her very much. I really really appreciated her massive help and still do. A saying that goes "A friend in need is a friend indeed" really holds true on her. I nervously waited. Then, 16.49. Slightly faster than I thought. My bro's SMS came. He sounded very surprised to get a birthday cake from Christine in Singapore that afternoon. He cheerfully asked if I sent him a cake and wondered when I sent it. He could not stop asking how I did it. At 16.54, my parents texted me too and asked me if I ordered a cake. I was so happy, as happy as he possibly was maybe, when I heard him so grateful and was over the moon to get the biggest cake he ever received. Three-layered Black Forest with Brandy. A very thick one. I was very glad too when my parents told me that he has smiled again then. I felt literally joyous throughout the evening. The feeling of giving a surprise like that to someone you care the most was exhilarating. I was yet to reveal how I did it to him and my family and never could thank Astrid enough for her help that day. And I wanted to know how my cake looked like. It was Astrid's 24th birthday and she happened to be in Singapore as she was attending a conference organized by City Harvest Church. After work, I got my self to find her a chocolate tart from POLAR as I promised her earlier. 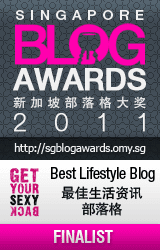 I presented it to her when I met her that night in Bugis. She was happy and pretty surprised that I really brought her the cake. Too bad she was too busy with the conference and due to limited time as well, we only got to see each other in Singapore twice during her 1 week visit here. So sad, huh? By the way, I paid my brother's birthday cake to her the day before on her first night in Singapore. Few days before I came back home for my Christmas holiday, she wrote me in my Facebook's wall that she's prepared 'something green' for me. Very fishy information. Green is my favorite color and she is well informed of that. I was curious. During my 10 days holiday in Malang, I did not have the chance to see Astrid at all. I did not go to church for two weeks there as I fell sick and was busy packing. Timing was no good to meet up with her. Then, two days before I had to come back to Singapore, I casually texted her - Where was my something green? She replied "Ah, yes. It's with me. What is your home address? Will you be at home tomorrow? I have particularly prepared it for you a while ago. I will send it to you tomorrow." I was still curious as she never told me what it was. I thought of a green doll, green photo frame, green book and other possible green gift or humored stuff. Next evening, my father called me and passed me something in a white plastic bag. From Astrid, he said. A courier just delivered it. I opened it. It was an English Bible. Its cover was green. I never thought she'd remembered me and gave me something like this. English Bible. Green. English Bible was something that I wanted to get for so long but have not bought it yet. And she knows well of how I can stare at something green for quite some time. She told me that when she was at the Asia Conference in Singapore, she saw this green bible and thought of me. So she bought one for me. I know English Bible was quite pricey. I felt so bad as I did not prepared any Christmas present at all for her, so I could only thank and thank her again for this. 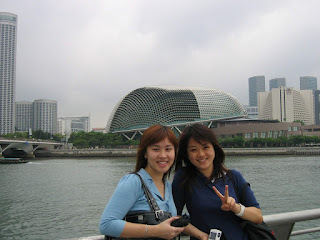 Astrid and Kur2 - Singapore Excursion Study, April 2005. Astrid, a close friend of mine since 2002, has always been a strong Christian youth leader at Church. 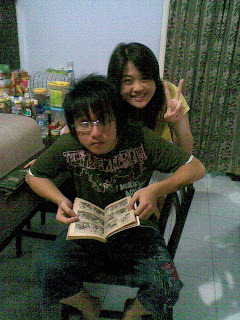 She was the one who was by my side when I decided to convert myself as a Christian in Christmas 2006. I deliberately asked her to accompany me when I had my pre-baptism consultation. She and her boyfriend were the only friends, other than my siblings, who accompanied me and witnessed me being baptized on Christmas Eve 2006. Before I came back to Singapore last January, she reminded me to read the Bible regularly. She said she has chosen the New English Version Bible for me so I can easily follow it. Don't have to worry so much on how to differ Thee and Thou. Gosh, I was and am still moved by her thoughtfulness. I responded, "I'll cover the Bible first with some plastic so it won't spoil and yes, will try to read it as often as I can". I must admit reading the Bible regularly nowadays can be quite a challenge to keep up. Chain reaction does exist. What goes around, comes around. John 2: 10: "Everyone brings out the choice of wine first and then the cheaper wine after the guests have had too much to drink; but You have saved the best till now". He always saves and has saved the best for me until now.